"Nothing says Christmas more than these little dog bones. The perfect holiday treat..."
Preheat oven to 350 degrees F (175 degrees C). Lightly grease baking sheets, or line them with parchment paper. In a large bowl, whisk the whole wheat flour and baking powder together until thoroughly combined, and stir in the cooked turkey meat and dried cranberries. Make a well in the center of the flour mixture, and drop the egg into the center; pour in the olive oil and about 1/2 cup of chicken broth. Mix into a soft dough. If mixture is too dry, mix in more chicken broth, about 1 tablespoon at a time, until dough is of desired consistency. Turn the dough out onto a floured work surface, and knead for 1 to 2 minutes. Roll the dough out 1/4 inch thick, and cut out with your favorite cookie cutters. Bake until the treats turn brown, about 25 minutes. 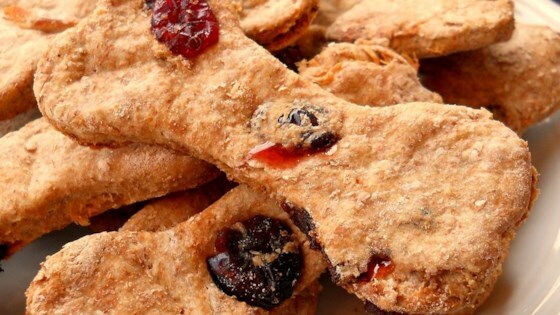 Turn the oven off, and leave the dog treats in the oven an additional 30 minutes to dry out. Refrigerate leftover dog treats.